ALLENTOWN — Alex Lyon, the chatty goalie who is coming off a 49-save performance that carried the Phantoms to a series-clinching 4-3 overtime win over Providence, showed Friday that he is ready for the next challenge in the AHL's Calder Cup playoffs: high-scoring Charlotte in the second round. The Phantoms beat the Checkers, 2-1, on Friday in the opener of their best-of-seven series. Charlotte had won 10 straight, including a three-game sweep over Scranton/Wilkes Barre in Round 1. Lyon had 29 saves. "Honestly, I don't like to put much stock in the other team," Lyon said after practice at the PPL Center on Thursday. "I think everybody in this room knows that if we play the way we're capable of, we're going to be just fine. Obviously you're aware of what they've got and their tendencies, but we're just focusing on ourselves." The teams went 4-4 against each other in the regular season. Lyon, 25, a former Yale University standout, filled in capably when injuries to Brian Elliott and Michal Neuvirth caused the Flyers to recall him from the Phantoms this season. In 11 games, he went 4-2-1 with a 2.75 goals-against average and .905 save percentage, helping the Flyers earn a playoff berth. "I think there's a fine line of wanting to be critical of yourself and wanting to also be proud of what you've done — and I'm very proud of the season I've had," he said. "It's really easy to go into the NHL, especially as a young goalie, and write yourself off quickly. You see guys trying to make their way, and all of a sudden you have four or five games without a win, and you're (labeled) an AHL goalie. That's just the nature of the business. So, I'm happy (how he performed) and proud of it, but at the same time, this is really the first time in my career where I feel I can add to that resume in the playoffs. It's a pretty valuable experience right now." Lyon and Anthony Stolarz are restricted free agents. The Flyers are expected to re-sign Lyon. Whether they re-sign the injury-plagued Stolarz may depend on if they deal Neuvirth. Elliott, assuming he is fully recovered from core-muscle surgery, will be the Flyers' No. 1 goalie when camp rolls around in September. 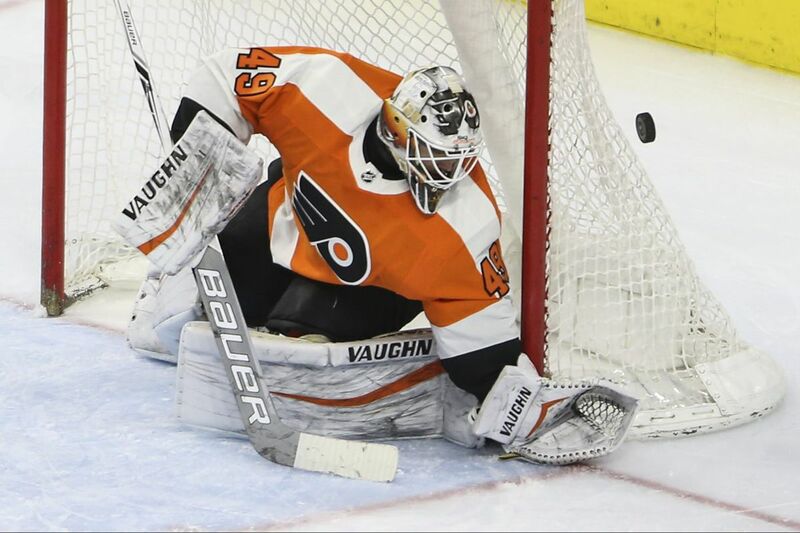 Barring a trade, Neuvirth will likely be his backup, with Lyon and Carter Hart expected to divide time in Lehigh Valley. As of now, it is not known if Stolarz — a once-promising goalie who has been hindered by knee injuries — will be in the mix. Assuming he is re-signed, Lyon said he will go into camp with confidence and with the idea of earning a spot with the Flyers. Right now, his focus is on steering the top-seeded Phantoms past a third-seeded Charlotte team that scored 14 goals as it swept its best-of-five series against the second-seeded Wilkes Barre/Scranton Penguins. After Lyon keyed the Phantoms' series-clinching win against Providence — Lehigh Valley won the series, three games to one — his postgame interview went viral. Providence dominated the game, but Lyon was the difference. He made 14 overtime saves and was still in a euphoric state after the dramatic home win. "Great job to the fans. Holy f—!" he said into cameras and microphones. "It was just one of those heat-of-the-moment things," he said on Thursday, smiling. "I think you get to use that one time in your life. And I used it up. I just felt like, 'What a moment!' And it just felt so appropriate at the time." Forward Phil Varone, the league's MVP, was injured and missed the final game against Providence and will not play Friday. Defenseman Samuel Morin will also be sidelined Friday with a suspected groin injury but is possible for Game 2 on Saturday, according to coach Scott Gordon. … Charlotte won back-to-back home games against the Phantoms in early April by a combined 9-2 score, but Oskar Lindblom and Travis Sanheim were with the Flyers at the time. Both are back with the Phantoms….The Flyers signed winger David Kase to an entry-level contract Friday. A fifth-round selection in the 2015 draft, he had nine goals and 23 points in 44 games in the Sweden Hockey League this season.